Milan 2015: a concrete cartoon monkey holding a tray forms this table by Spanish designer Jaime Hayón for manufacturer BD Barcelona Design. Hayón's table is shaped like a monkey from the waist up, and holds a flat tray above its head like a waiter. It is made from solid architectural concrete resin, making it suitable for indoor and outdoor use. "I just love the idea of a tropical animal – the monkey – serving you in a funny position," Hayón told Dezeen. "I thought I could use this reference, which has been used before in certain types of tropical furniture, and bring it back to modernity with the use of concrete resin." 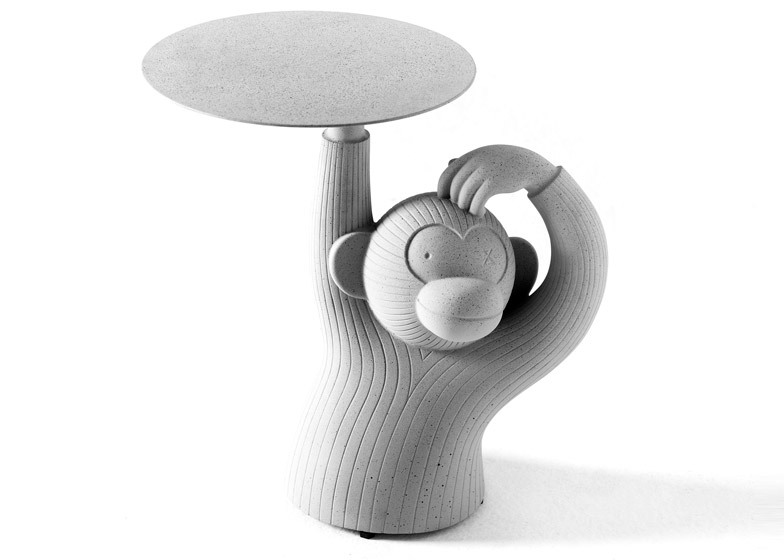 The form of the cartoon monkey – with one hand supporting the platter and the other scratching its head – is created using a mould based on Hayón's drawings. "If you look up old African tables that referenced animals before, they were all made in wood," said the designer. "I thought it was interesting to use a very modern and sophisticated material to get a stronger concept." Hayón's previous designs include a giant green chicken and a rocking horse shaped like a hot dog. The Monkey Table is the latest addition to the designer's Gardenias collection of outdoor furniture launched in 2013 for BD Barcelona Design, which also includes aluminium and terracotta pieces. "To me this is a nice piece, with nice quality and with a glimpse of humour, but very functional and innovative in the material use," said Hayón. "It also brings a tropical feeling to the outdoors." "The most relevant thing for me is just to create things that I really love – and I hope people will love it as much as I do," he added. The Monkey Table will launch in Milan next week during the city's annual design festival.